After a short period of unusually warm weather, after today comes a cool period that brings rain, drab and coldness. Cold weather awakens the need to eat different, intense, full flavored food that keeps the body and soul warm. Thus came the (I’m thrilled to announce) clove period! Wooohooo! Clove (lat. Syzygium aromaticum) is a traditionally favorite winter spice. It comes from the iIndonesianspice islands, northern Moluks. Today it is cultivated in Brasil, India, Shri Lanka, Tanzania, Madagascar and Pemba. Cloves are actually unripe, unfloursihed flower buds of the evergreen tropical plant, which belongs to myrtle family. 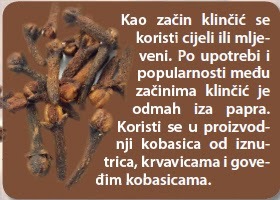 Fresh cloves are pink and dried ones have this rusty brown color. They are 12-16 mm long and look like little nails (lat. clavus means nail). Their smell is warm, tart and aromatic, and their taste is sweetly tart and very strong. Clove was mentioned for the first time in Chinese scripts which date in 400 BC. Romans were introduced with this valuable spice by Arab merchants. 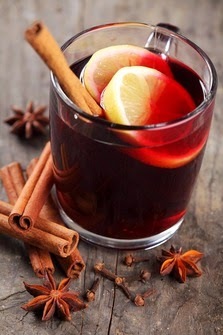 Aside from being an inevitable spice for winter delight: mulled wine, clove is used in many sweet and salty dishes. It works great in apple-pear combinations, therefore it is used in making apple/pear pies, fruit sauces and compotes. It emphasizes the citrus aroma, especially orange aroma. Considering it has a really strong taste, you should be very careful with the dosage. Rich flavored cakes, cookies, puddings, sweet breads often contain cloves combined with cinnamon and ginger. Whole cloves are very tasty in pea/bean soups, or baked chili beans, where their strong spice quality gives the flavor its richness. Also, you can press couple of cloves in a cleaned onion and add to rice while it’s being simmered. Clove is present in many spice mixtures for pickling vegetables or for frying and bbq-ing. It is used mostly in indian cuisine, as one of the ingredients of garam masala spice mixture. It also used in dutch cuisine (indonesian influence) for cookies and cheese. 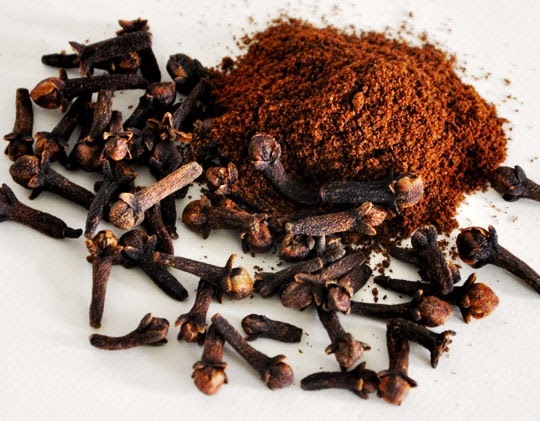 You should buy whole cloves because ground ones lose their aroma and medical effectiveness quickly. Whole cloves last a year, ground cloves six months. Since it has a very rigid structure it is hard to gorund, so I advise you to use coffee grinders. “AS A SPICE, CLOVE IS USED WHOLE OR GROUND. Clove is mostly known as a spice, but it is also a valuable medicine. 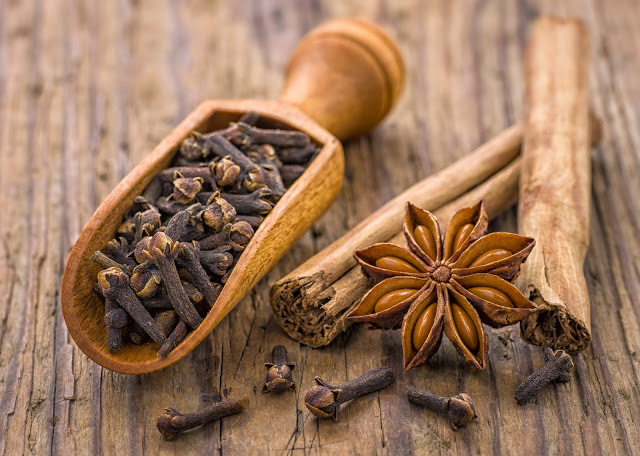 Traditional chinese doctors use cloves for indigestion, diarrhea, hernia and fungal infections. Couple of drops of clove’s aromatic oil, mixed with water, will prevent vomiting, infusion will prevent nausea. Clove’s aromatic oil is effective against many bacteria and parasites. Clove is a great stimulant, antiseptic and a mild anesthetic. It has positive effects on gastric mucosa, indegstion and flatulence. 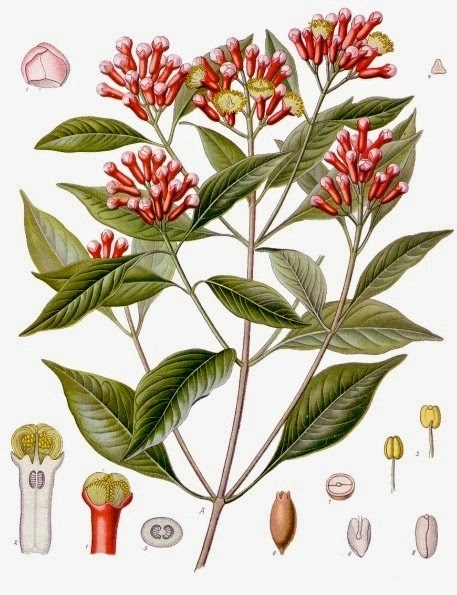 Dentists used, in the past, clove’s aromatic oil as an oral anesthetic. They used it for root canal disinfection. Rinsing your mouth with a combintation of water and oil, or chewing fresh buds can prevent sore throat. Folk tradition says that dissolution of two cloves in your mouth curbs alcohol desire. It is important to mention that this spice is also a great aphrodisiac. You can make tasty and curativ tea with cloves and cinnamon. In 0,5 l of water put two cinnamon sticks and 6 whole cloves. Cook for 15 minutes and then drain. Have 2-3 cups a day. It is also used in cosmetic industry, its aromatic oil is used for perfumes. 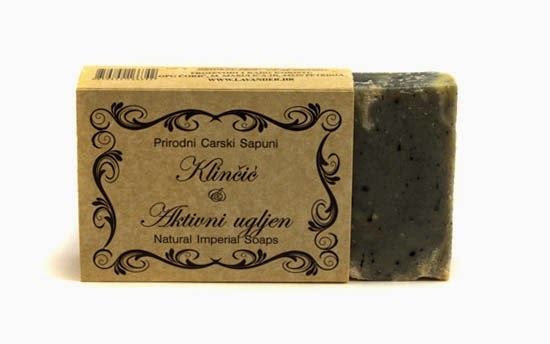 Soaps with clove have a positive effect on reducing fat layers and cellulite, and a combination of clove and active coal makes a great peeling that revitalizes skin and removes surface impurities. Slice onion (very thin), chop the garlic and slightly fry it on olive oil. Add clove, sugar, salt and pepper. Cover the pan and cook it on low heat for 3 minutes. Meantime slice eggplant and tomatoes (fat slices) and heat up the oven (400 Celsius degrees). Grease the bottom of a refractory bowl with butter, put a layer of eggplants, cover them with half of the onion/garlic mixture, sprinkle with half of the cheese, then add tomatoes and the rest of the onion mixture and cheese. Put a little butter on the top, cover with foil and bake for half an hour. 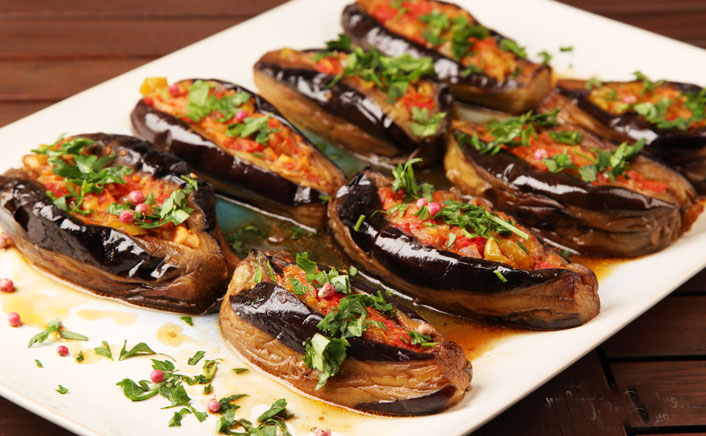 Remove the foil and leave it be in the heated oven until the eggplant softens (cca 10 minutes). It’s best served with rice.